Are you missing the train with your E-Business platform? 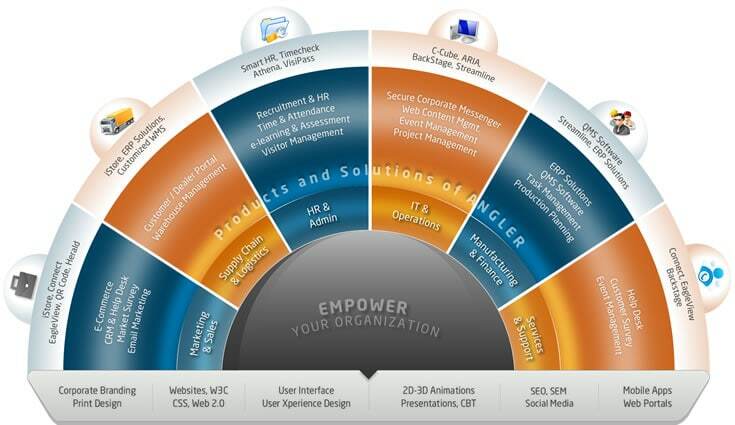 ANGLER's Software Products & Solutions helps you to empower your business. Accelerate your Business Velocity with our Enterprise Grade Software Products & Solutions. With ever increasing business complexities and rapid market changes, there is an increasing urgency for all companies to leverage technology solutions while improving focus on your core businesses. We have our own cutting-edge e-Business Products Suite for Timesheet & Project Management, E-commerce Storefront, Corporate Instant Messaging, CMS (Content Management System), CRM / SFA / Helpdesk, E-Learning, HR Solutions, QR Code Builder, Event Management Software, Survey Builder Tool, Visitor Control System and Mobile Applications. We provide experienced expert advice – from strategy how to effectively deploy information technology to operation support and execution. ANGLER aims to be your reliable IT partner providing innovative products, generating value with custom solutions, architecting your online road-map or mobile application platforms while ensuring delivery of the highest quality. Below are a few unique advantages why clients work with us.